Side dishes don’t usually get top billing and are often overlooked because well; they are just side-dishes! That is until today! While green beans are good on their own, Southern Sweet and Sour Green Beans ups the ante, and is the kind of side dish, that will have you coming back for more and more! 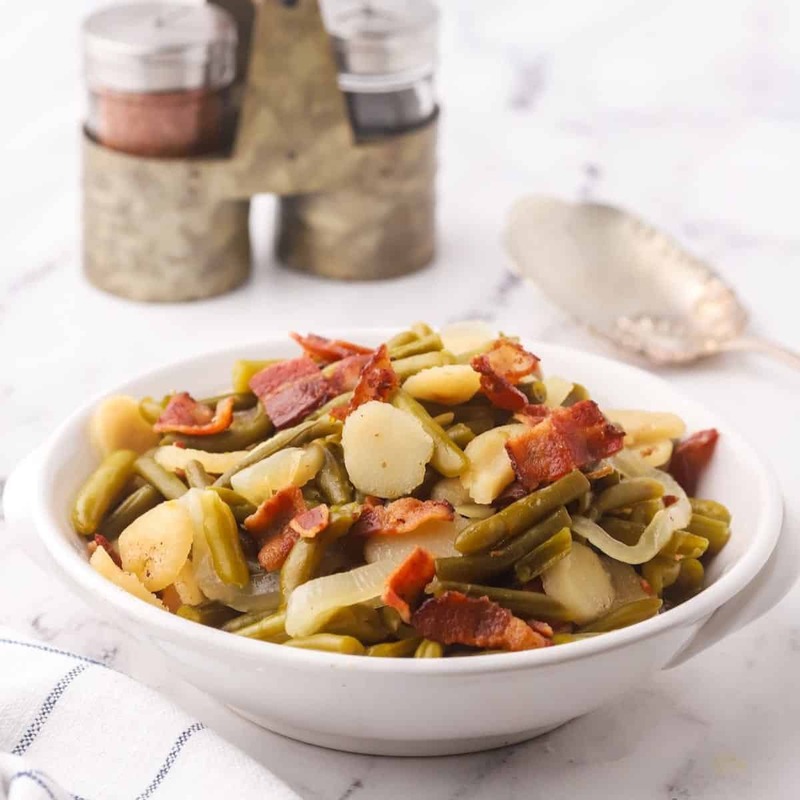 If you are looking for fabulous green bean recipes for Thanksgiving, look no further than Southern Sweet and Sour Green Beans with bacon and onion. 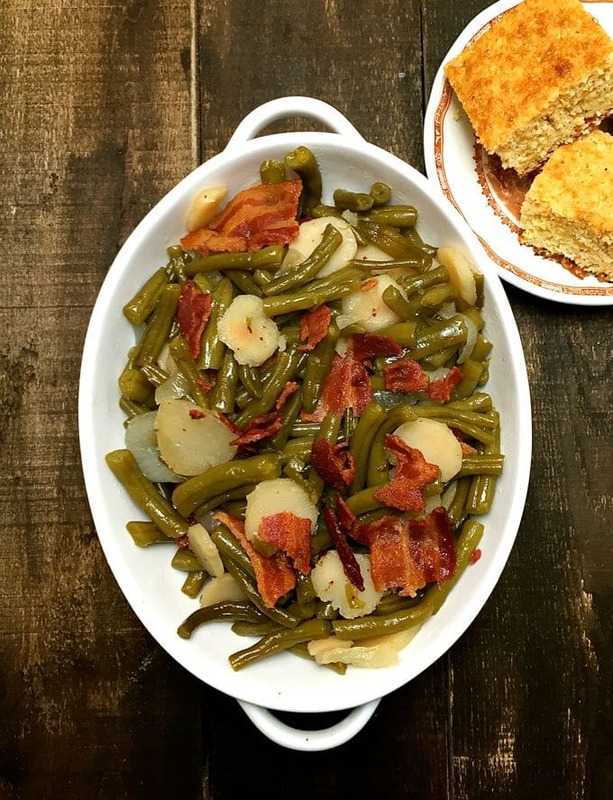 This easy recipe which used canned green beans makes a flavorful side dish with an unexpected twist for your Thanksgiving or any holiday dinner for that matter. So it’s move over Green Bean Casserole, there is a new green bean side-dish in town! 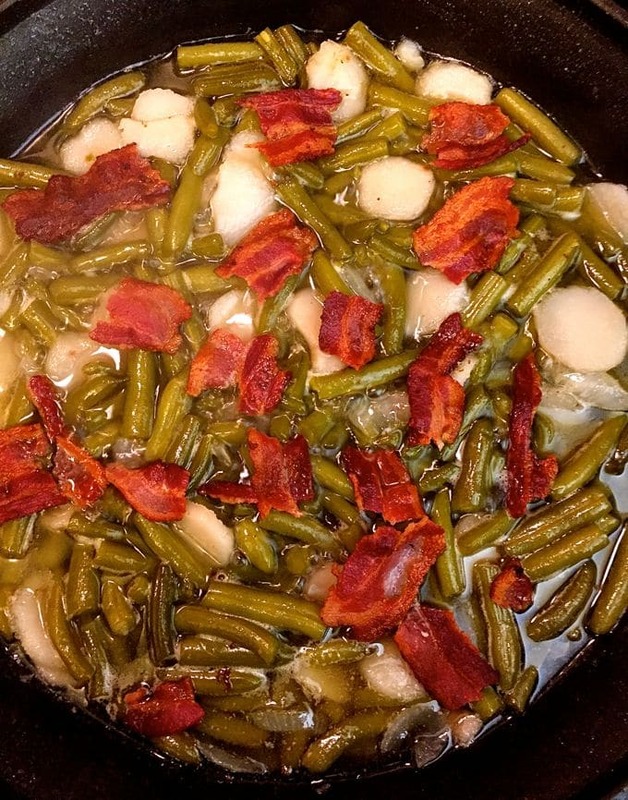 Other green bean recipes on my blog which I hope you will try too, include Southern Green Beans and New Potatoes, Green Bean Bundles Wrapped in Bacon, Green Bean Pie with Ritz Cracker Crust, and Roasted Green Beans with Lemon and Bacon. If you are in a hurry and need to get a vegetable on the table, the quickest and easiest way to cook canned green beans is on the stove. Simply drain the can of beans and add to a skillet over medium heat. Add about a tablespoon of butter or bacon grease. Once warmed through, add your choice of salt or garlic powder. Then, add tablespoon or so of pesto, lemon zest, crumbled bacon, cherry tomatoes which have been halved or parmesan cheese and serve. 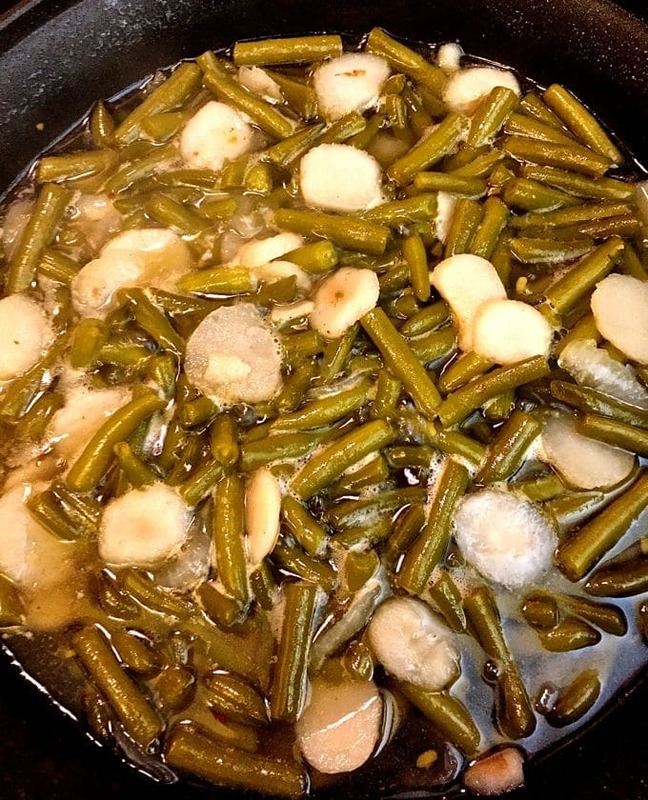 This recipe for Southern Sweet and Sour Green Beans comes courtesy of Brenda Godfrey of Fairhope, Alabama who is my son-in-law’s mother. 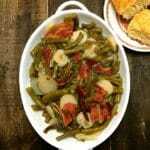 My husband’s daughter Kara prepared this scrumptious Sweet and Sour Green Beans side dish for us last year. And, generously shared Brenda’s recipe with me so I could share it with you! There are only six ingredients in Sweet and Sour Green Beans: canned green beans, water chestnuts, onions, bacon, sugar, and vinegar. That’s it! 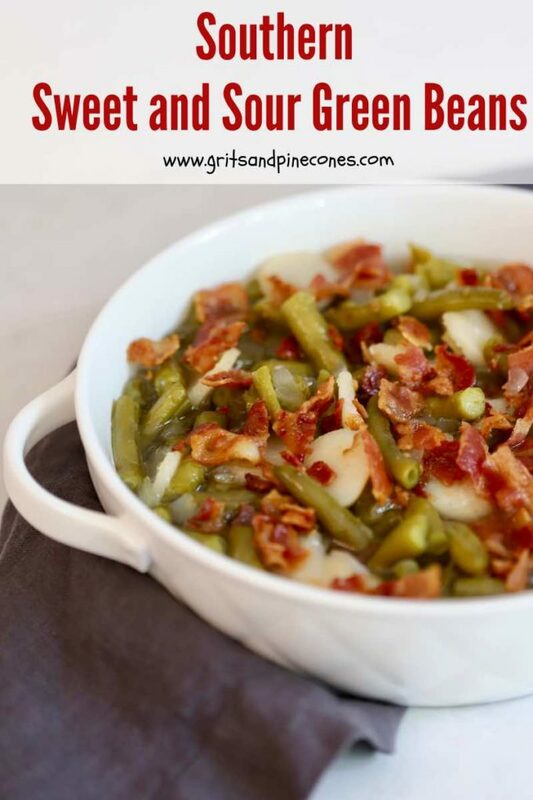 And, it’s a quick and easy green bean recipe to prepare! How to make Southern Sweet and Sour Green Beans! 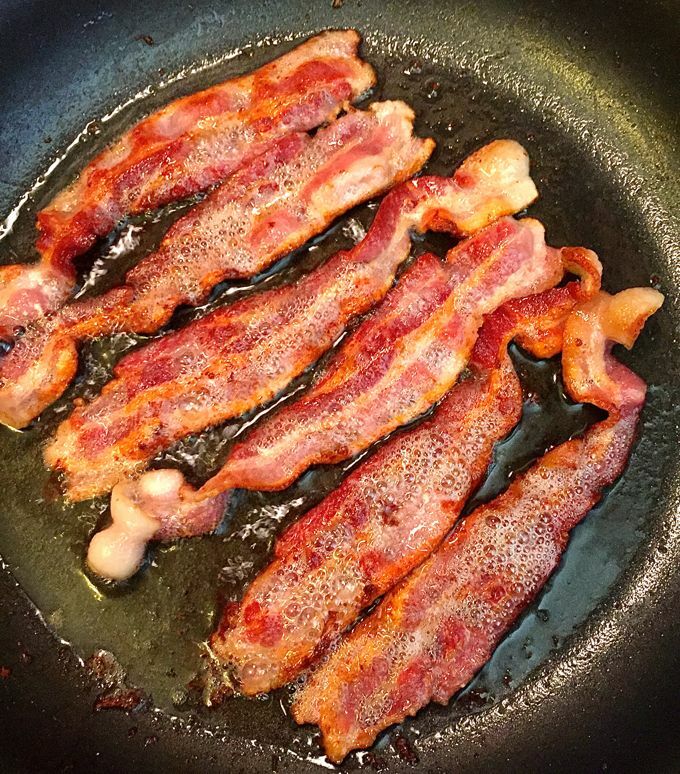 1 Preheat the oven to 350 degrees F.
2 Pan fry the bacon in a large oven-safe saute pan over medium-low heat. Turn frequently and cook for about 10 minutes or until it is browned and crispy. Remove from the pan and drain on paper towels. 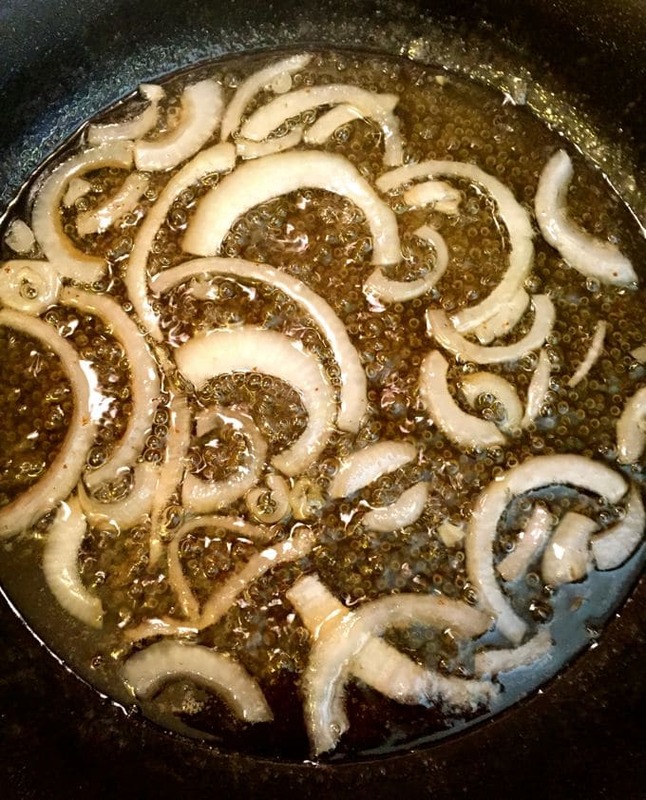 Leave the drippings in the pan. 3 Add sugar and vinegar to the pan drippings and stir until well combined. Add the onions and cook for 15 minutes. 4 Add two cans of green beans, one drained and one not drained, and add a can of drained sliced water chestnuts. Combine and simmer for 5 minutes. 5 Crumble the bacon and add it to the green bean mixture. Cover and bake in the oven for 30 minutes. What to serve with Southern Sweet and Sour Green Beans? Green beans and cornbread just go together, and either my Traditional Southern Style Cornbread or gluten-free Old-Fashioned Southern Cornbread recipes would be the perfect accompaniment! Southern Sweet and Sour Green Beans are delicious served either warm or at room temperature. You can also make Southern Sweet and Sour Green Beans up to 24 hours ahead and simply reheat before serving. You can substitute fresh cooked or frozen cooked green beans for the canned green beans. But you might have to add about 1/2-3/4 cup of water or chicken broth to make up for the liquid. Sweet and Sour Green Beans is definitely one delicious green bean recipe that deserves a place of honor in your repertoire of "go-to" green bean recipes. So it's move over Green Bean Casserole, there is a new green bean side-dish in town! Pan fry the bacon in a large oven-safe saute pan over medium-low heat and frequently turn for about 10 minutes or until it is browned and crispy. Remove from the pan and drain on paper towels. Leave the drippings in the pan. Add sugar and vinegar and stir until they are well combined. Add the onions and cook for 15 minutes. Add two cans of green beans, one drained and one not drained, and add the can of drained sliced water chestnuts. Combine and simmer for 5 minutes. 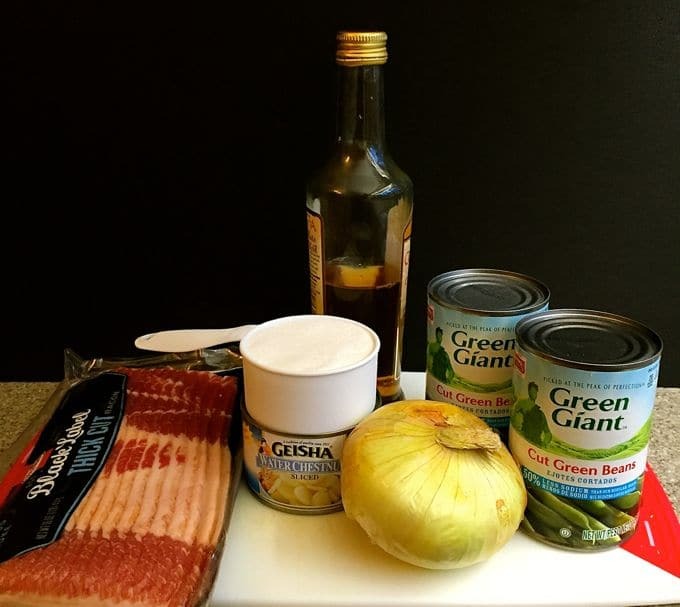 Crumble the bacon and add it to the green bean mixture. Cover and bake for 30 minutes. Southern Sweet and Sour Green Beans are delicious either warm or at room temperature. You can substitute fresh cooked or frozen cooked green beans for the canned green beans, but you might have to add about 1/2-3/4 cup of water or chicken broth to make up for the liquid in the canned green beans. Why so much sugar and vinegar? This is an old-fashioned recipe given to me by a friend. The amounts of sugar and vinegar are what the recipe calls for and that’s the way I’ve always made it. If you decide to experiment by using less sugar and vinegar, please let me know how it turns out.